Lend our expertise to the design of your home, be that a standard floor plan with your modifications or a custom design of your own. Assist you with the permitting process, including obtaining certified blueprints. Help you find a mortgage/ financing package. 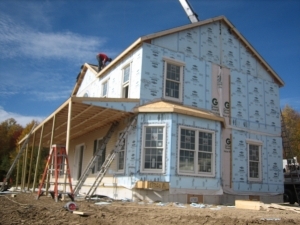 If required, assist with the installation of your foundation. Deliver to your site a home which is about 90% complete. Provide the crane and set crew to set the house on your foundation. Refer sub-contractors whom we use on a regular basis to perform the finish work.